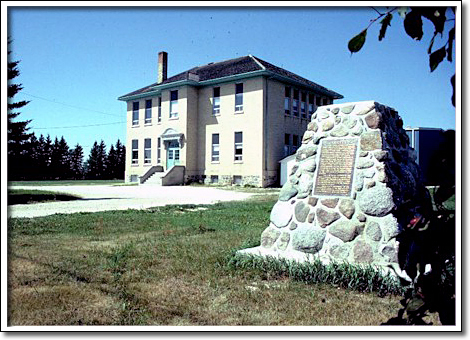 As Manitoba's communities expanded during the late nineteenth century, the need for larger school facilities resulted in the construction of scores of impressive new schools. For many communities this was their largest building; two storeys high, usually of brick, and often with fine architectural details. By the 1950s, however, as school district consolidation took hold, the rural educational fabric changed dramatically. The ubiquitous one-room schools were amongst the first to be phased out. But many of the large centralized schools also followed, replaced by more modern structures. By the 1960s only a handful of the big schools remained. That turn of events makes Brant School all the more special, a rare survivor, and the only example of the few survivors still used as a school. Built in 1914, the building is typical of its type. It is a solid block, well lit by banks of windows. The design is formal, with the main entrance accented with a carved limestone canopy. Inside, the school still boasts the original staircase and pressed metal ceiling panels.